Everyone’s heard the “think outside the box” saying enough over the years. It’s such a cliché that I’ve heard of some offices that have banned the phrase because everyone was too busy rolling their eyes to engage in discourse. It’s become a catch-all saying when a manager wants his or her employees to do things a little differently. 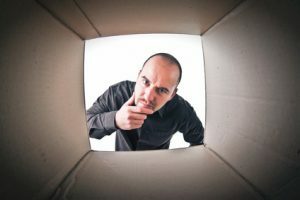 Well, today I’m here to defend “the box.” While different thinking can be a great way to come up with some innovative ideas, it can also lead to some crazy off-the-wall campaigns that don’t make any sense. Sometimes going with the grain is actually the best thing to do! The problem with “think outside the box” is it eliminates any common or overused ideas. For example, if you’re coming up with ideas for a Facebook campaign for a financial company, inside the box thinking would tell you to keep it professional. Most customers of a financial company want stability and professionalism to help them feel like the company takes their security seriously. A manager who wants employees to think outside the box, though, might go with an idea to “have fun” with the campaign. Make some jokes and post funny pictures and generally have a good time. While that may work occasionally to lighten the mood, doing it all the time likely will be a disaster. And that’s the big problem with always thinking outside the box. It discounts the possibility the norm is what works. It may be “boring” in a sense but you can’t deny what works, works. Results are what matters, not someone’s bruised ego or sense of adventure. Another aspect that keeps some managers from considering “well-used” ideas is they won’t separate the company from the rest of the business world. If you don’t have one big crazy idea nobody will notice the business as they’re just like everyone else. This is a valid point. The business world, especially online, is riddled with failed companies with great ideas but no results. You do have to have something that separates you from the rest of the pack or you risk disappearing into the sea of faces. However, that doesn’t mean absolutely every detail of your company has to be something new and radical. People talk about Zappos’ customer service, which is amazing – but would that work with every company? Likely not, and furthermore the more companies that perform like that the less they individually stand out. Concentrate instead on finding what makes your company stand out already – great products, warm atmosphere, funny customer service agents, whatever. If you focus on that aspect and build it up to be the best it can be, you may naturally find what separates you from the rest of the business world, and you don’t have to fall back to coming up with crazy antics and “outside the box” tricks to be successful. What are some other cliché business phrases that need to disappear?